Thematic is used by companies to help understand what drives customer loyalty and retention. 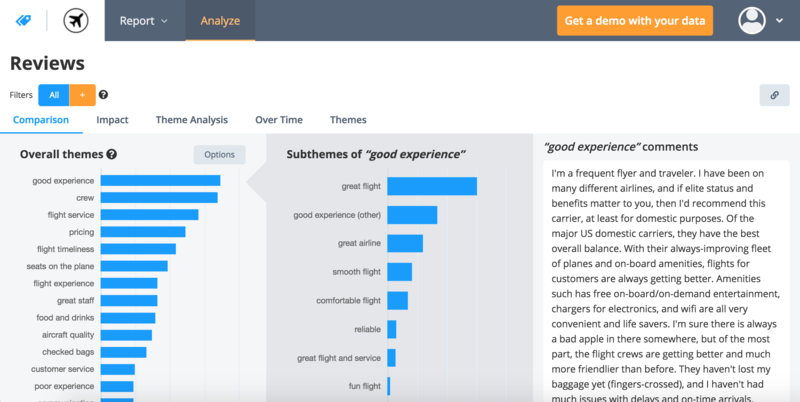 We pull in survey responses from customer feedback surveys (NPS etc) along with metadata about each response and analyze the free text comments to produce a list of themes. Our analysis tools can then be used to identify what people are mentioning most frequently, what is driving scores up or down and to track these things over time as more responses come in. We also have tools to create dashboards for sharing in the organization and to help benchmark regions or departments against each other. These can be converted into reports and sent via email or as Powerpoint presentations.